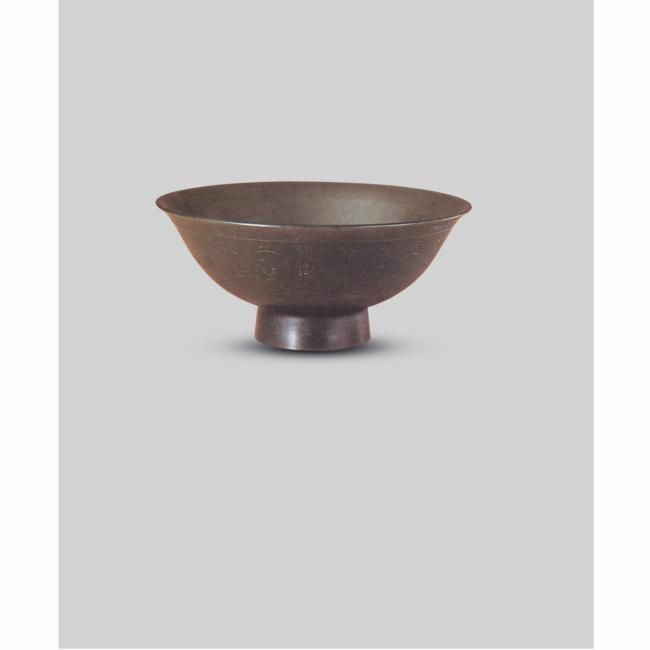 NOTE: It is rare to find jade vessels of this shape which is based on archaic bronze ritual wine vessel zun of the Shang and Western Zhou dynasties. See a late Shang zun, in the Shanghai Museum, illustrated in Zhonguo qingtongqi quanji, vol. 4, Beijing, 1998, pl. 127; and another Shang period zun included in Robert W. Bagley, Shang Ritual Bronzes in the Arthur M. Sackler Collections, Cambridge, Mass., 1987, pl. 49. By adding the vertical lobes, alternately defined by raised and recessed lines, the impression is also given of four independent zun forms, superimposed upon each other and narrow enough to form the shape of gu, another archaic bronze vessel thus invoking two ancient bronze forms in one, while transforming the whole piece into an 18th century innovative design. The present vase is also influenced by zhadou forms which became standardized by the Ming dynasty in ceramics, although this vase, with its constricted mouth, was probably never intended to serve as a cuspidor or zhadou, and was possibly made primarily as an ornamental and decorative object. 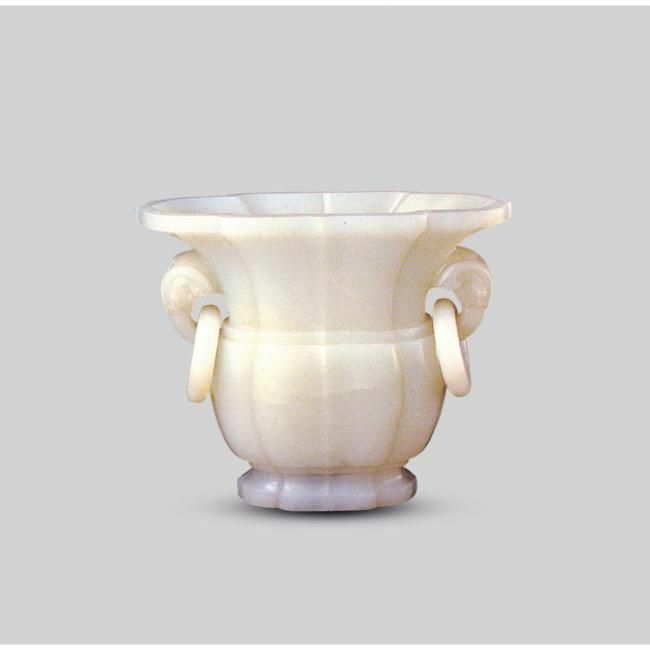 For related zun form vessels see a white jade vase, in the Palace Museum, Beijing, published in Zhongguo yuqi quanji, vol. 6, Shijiazhuang, 1993, pl. 154 (fig. 1); another vase carved of spinach-green jade, ibid., pl. 149; a white jade example, from the collection of the Countess of Halifax, sold at Christie's London, 13th February 1978, lot 125; and a zhadou carved with petal flutes rising from the ring foot to the flared barbed rim, from the estate of Antoinette H. Van Slyke, sold in our New York rooms, 18/19th April 1989, lot 213. 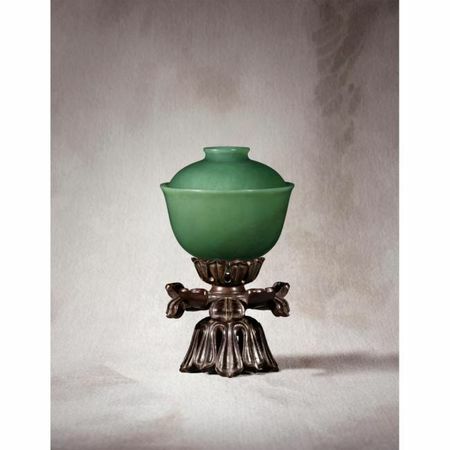 Semi-transparent sage-green jade pieces made of pebble material, such as the present vase, was especially popular with the Qianlong emperor. The stone used for the making of this vase has a bluish tone which is distinctly different from the standard spinach-green with its black flecking. For examples of Imperial vessels made in jade of this colouration see the bowl and cover in this collection, lot 1816, with a Qianlong yuyong (For the Imperial Use of the Qianlong Emperor) mark inscribed on the base. The elephant-head handles on this vase represent a contemporary design concept with an auspicious message making the object a highly desirable one. The elephant is closely associated with Daoism and is the symbol of peace. During Qianlong's reign, real elephants were used in processions when celebrating the Emperor's birthday. During New Year festivities, the elephant represented the time for renewal. EXHIBITED: Exhibition of Chinese Applied Art, City of Manchester Art Gallery, Manchester, 1913, cat.no. 112 or 113 (one of a pair , one of them illustrated). NOTE: Jade carvings after the archaic bronze ritual vessel jue are rare although a closely related pair, also with a Qianlong reign mark and of the period, from the von Oertzen collection, is illustrated in S. Howard Handford, Jade. Essence of Hills and Streams, Johannesburg, 1969, pl D3. The von Oertzen vessels are also incised with the numbers nine and ten, respectively, on the base. Handford, ibid., p. 119, notes that the legs and the spout of the bronzes were somewhat longer proportionally, and the tail somewhat shorter, while the columns, probably designed to hold a strainer, were set nearer to the spout. While the original usage was overlooked or neglected in the Qing dynasty, the high quality and the fact that the vessels are serially numbered suggest that they may have been used in an official or ancestral rite. 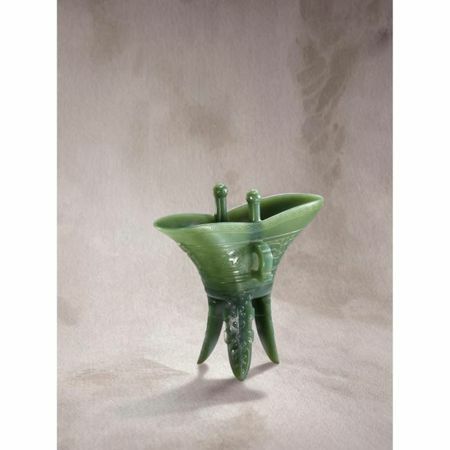 Compare also a slightly larger white-jade jue, formerly in the collection of the Milwaukee Art Museum, included in the 75th Anniversary Exhibition of Port-Archaic Chinese Jades from Private Collections, S. Marchant and Son, London, 2000, cat. no. 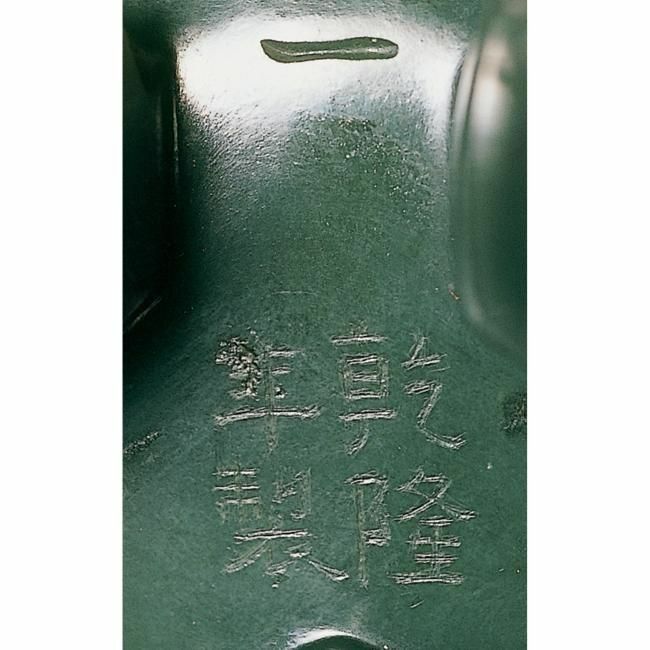 7; and three almost identical jade jue, one unmarked and the others with Qianlong and Jiaqing marks, respectively, included in the exhibition Jade as Sculpture, Minnesota Museum of Arts, Minnesota, 1975, cat. no. 87. For the inspiration of the form see two archaic bronze jue of the Shang dynasty illustrated in R. W. Bagley, Shang Ritual Bronzes in the Arthur M. Sackler Collections, Washington D.C., 1987, pls. 12 and 13, together with a jue attributed by Bagley to the 12th and 11th Century B.C., pl. 18. PROVENANCE: Acquired in Hong Kong, 2002. NOTE: In its elegant form this stem-cup is after the famous Ming dynasty white jade stem-cup of the same dimensions with similar flared mouth, a sloping wall, and a curved body gracefully balanced on a stem foot, in the Tibet Museum, Lhasa, included in the exhibition Treasures from the Snow Mountains. Gems of Tibetan Cultural Relics, Shanghai Museum, Shanghai, 2001, cat. no. 98, together with its packing case, pl. 99. A Qianlong period jade stem-cup with the high stem foot covered in gold leaf, also from the Tibet Museum collection, was included in the Shanghai Museum exhibition ibid., cat. no. 100. 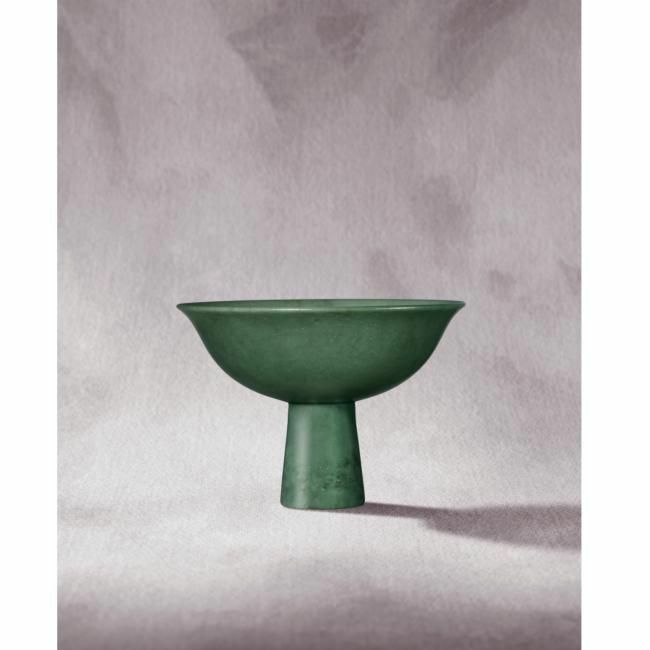 Compare also a Khotan jade stem-cup of celadon tone shaped after chrysanthemum petal, of similar size to the present piece, in the Palace Museum, Beijing, published in Chinese Jades Throughout the Ages – Connoisseurship of Chinese Jades, Vol. 11, Hong Kong, 1996, pl. 14, similarly attributed to the Qing dynasty. Jade stem-cups are after early Ming, Yongle period, ceramic prototypes made in the Imperial kilns at Jingdezhen, Jiangxi province. See a Yongle white-glazed stem-cup with anhua decoration included in the Shanghai Museum exhibition op.cit., cat. no. 93; one from the Brankston collection illustrated in John Ayers, Far Eastern Ceramics in the Victoria and Albert Museum, London, 1980, col. Pl. 43; and a third example in the British Museum, London, published in Jessica Harrison-Hall, Ming Ceramics in the British Museum, London, 2001, pl. 3:1. Stem-cups of this type were much favoured by the Tibetan nobility and were used for drinking wine. Tibetan men habitually carried a stem-cup with them when they were out. It was considered an ominous sign if a cup broke, hence they were usually carried in their own packing case generally made of metal, lacquered wood or leather. PROVENANCE: Christie's London, 15th June 1998, lot 269. NOTE: The yuyong mark, which designated objects for the personal use of the Emperor, is certainly the most prestigious among all marks found on Imperial wares, followed closely by the yuzhi designation, which applied to objects made by Imperial command. The yuyong mark was only used on rare occasions for the Emperor's most admired objects of which the present piece is a fine example. See another similar translucent mottled green jade bowl with the Qianlong yuyong mark, in the Palace Museum, Beijing, illustrated in Chinese Jades Throughout the Ages – Connoisseurship of Chinese Jades, vol. 11, Hong Kong, 1996, pl. 23 (fig. 1). For examples of jade vessels bearing the Qianlong yuyong mark, see a covered light-green jade bowl included in the Special Exhibition of Hindustan Jade in the National Palace Museum, National Palace Museum, Taipei, 1983, cat. no. 19; two bowls decorated with inlays, one in the Richard Fuller collection published in James Watt, Chinese Jades from the Collection of the Seattle Art Museum, Seattle, 1989, cat. no. 101, and the other in the Palace Museum, Beijing, illustrated in Zhongguo yuqi quanji, vol. 6, Shijiazhuang, 1993, pl. 63; and a bowl with two dragon handles, also in the Palace Museum collection, included ibid., pl. 33. 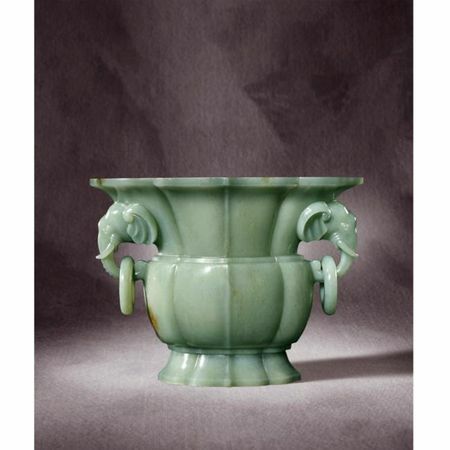 Jade of this colouration was much favoured by the Qianlong Emperor who had a number of pieces made of similar mottled green stone. Compare a large vase and cover illustrated in Robert Kleiner, Chinese Jades from the Collection of Alan and Simone Hartman, Hong Kong, 1996, pl. 136, together with a meiping with a Qianlong reign mark and of the period, pl. 138, formerly in the Fogg Art Museum, Harvard University, Cambridge, Mass. See also two hu form vases, in the Palace Museum, published in Zhongguo yuqi quanji, vol. 6, Shijiazhuang, 1993, pls. 189 and 190, and pl. 201 respectively. 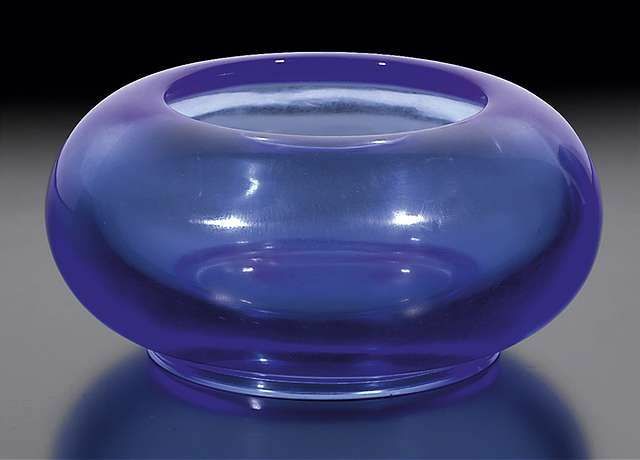 A sacrificial red-glazed stembowl. 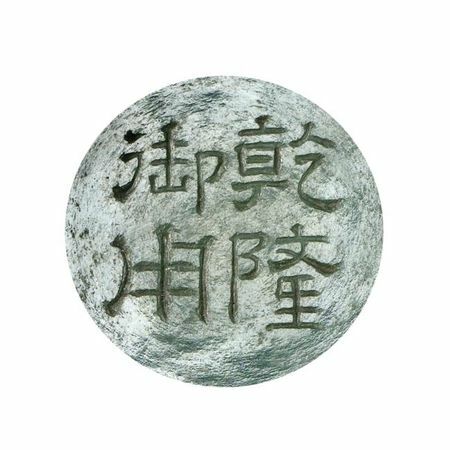 seal mark and period of qianlong.